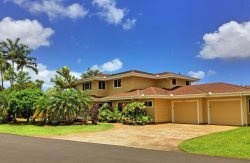 Pu'u Poa is perched blufftop, with fantastic views! Nicely manicured, each unit is positioned to experience maximum views. These 2 bedroom, 2 bathroom units are spacious and private. Each condo is elegantly appointed and located directly next to the Princeville Resort and Hideaway Beach. Top Floor, Beautiful Ocean and Bali Hai Views!!! !